Light sleeper that I am, I felt Bragi gently nudging the side of a lock a few times during the night. Ah, I supposed drowsily, with all these locks we must be in the Main-Danube Canal. But my pre-cruise fears of nighttime noise and bright lights were for naught; I had no problem returning to dreamland. I awoke to my alarm, and although I was happy with our morning balcony view I felt just the tiniest bit sad to see this day arrive. You see, today is the official halfway point on our cruise, which means that one week from now we will be disembarking in Amsterdam. Heaving a sigh of resignation, I went off to seek solace in breakfast and a fresh cup of coffee. 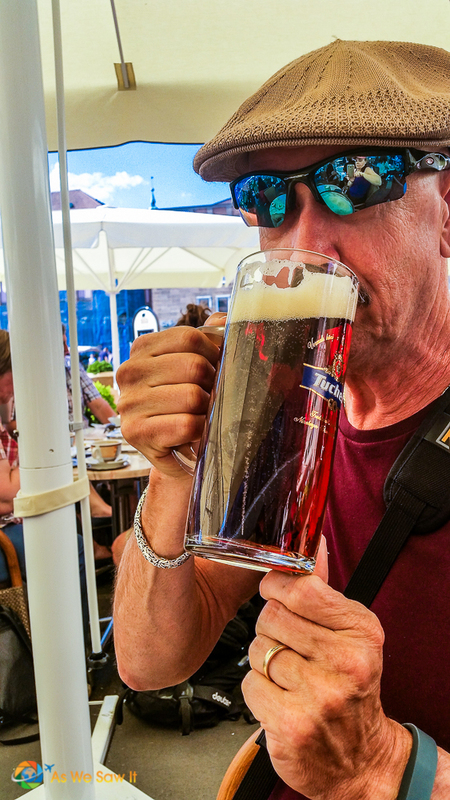 Bragi's lock schedule meant we wouldn’t get into Nuremberg until after lunch. To fill the time we were offered a choice of an 8:30 excursion into Nuremberg for a few hours of shopping (return shuttle at 11:15) or a presentation on Bavaria by a guest lecturer. Not being fond of souvenir shopping Dan and I stayed on board. He carried coffee and camera to our balcony while I went off to attend the professor's lecture. It was quite interesting to learn more about what makes Bavaria and Bavarians so unique. This afternoon’s foray into Nuremberg offered options as well. Figuring we likely wouldn't return to Nuremberg if we took the optional tour we spent quite a while debating which tour to take. The biggest issue was that Dan’s grandfather was at the Battle of the Bulge and he finds all things World War II fascinating. Not I. To my way of thinking Nuremberg was little more than the Palace of Justice, only important because it was home of the Nazi party headquarters and the site where they held the Nuremberg Trials. But I digress. Ultimately, we decided to tour the city and plan our own World War II tour another time. Nuremberg is not on a major river so we had to take a bus into town. This gave us time to get the low-down about the city. We drove by the Palace of Justice, where the Nuremberg Trials were held. It's still in use as Nuremberg's courthouse. 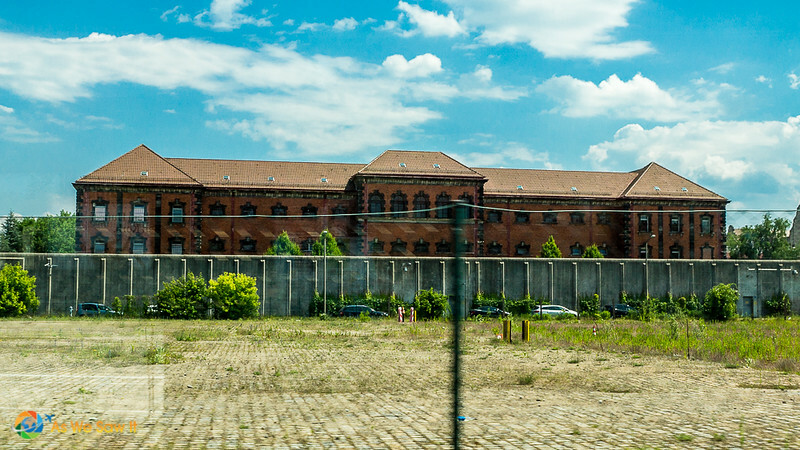 Behind it was the prison where the Nazi war criminals were held. Not long afterward we encountered a crazy amount of traffic. Cars were double- and triple-parked on side streets and people were all heading in one direction. Obviously, something big was happening: Nuremberg was hosting its annual weekend Rock-im-Park rock fest in Zeppelin Field. It's good to know they have finally found a good use for the old Nazi rally grounds. Concert-goers create beer slings out of recycled containers and tape. Very resourceful. 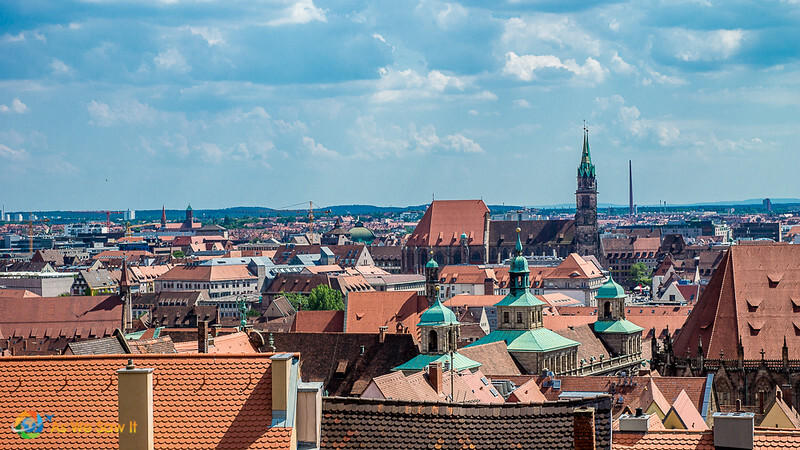 Nuremberg has been described as the “unofficial capital” of the Holy Roman Empire and the center of the German Renaissance. It was an important trading center, and in fact some of the most important trade routes intersected here. 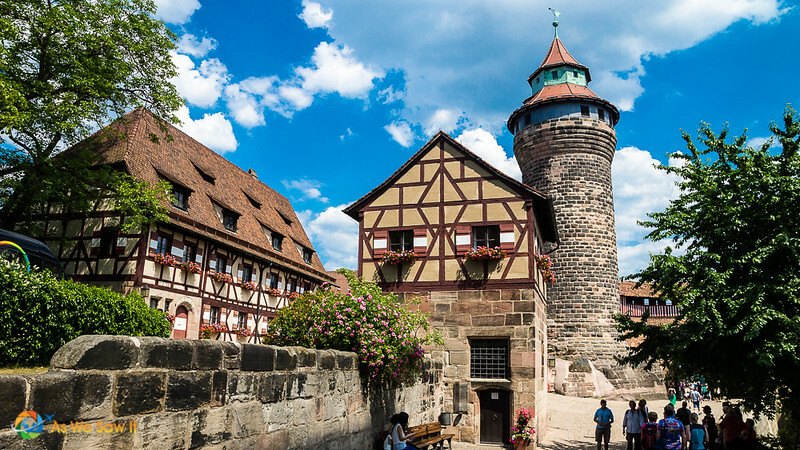 Nuremberg was also well-known for its craftsmanship – toys (14th century) and pocket watches (15th century). 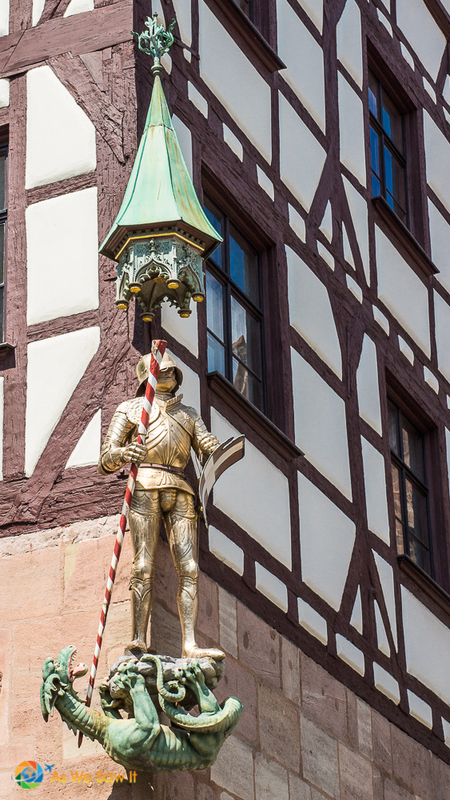 Actually, Nuremberg is still famous for its toys, and the city actually has a toy museum to show for it. New kings held their first parliamentary session and kept the Imperial jewels here. 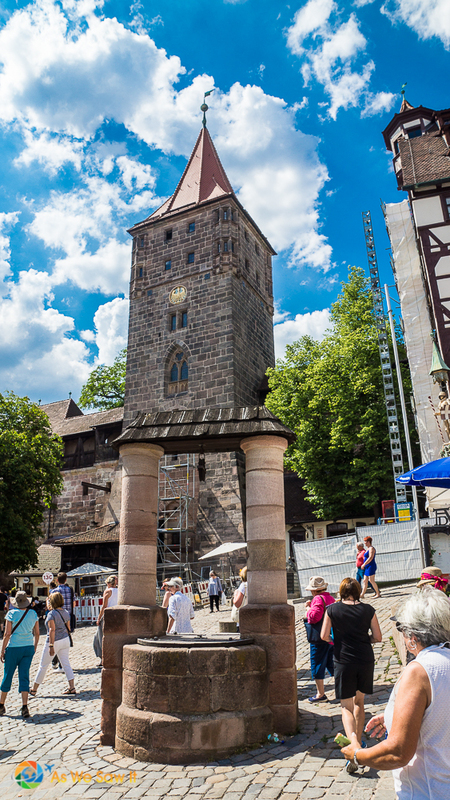 Bye-bye, Medieval Nuremberg, hello, tourists! Sadly, Nuremberg's importance to the Third Reich made it a favorite allied bombing target. Over 90% of Nuremberg was reduced to rubble, second in destruction only to Dresden. Since the 1950s the Medieval center’s red sandstone buildings and mostly Gothic architecture have been painstakingly rebuilt into a favorite tourist destination. Today was our turn. 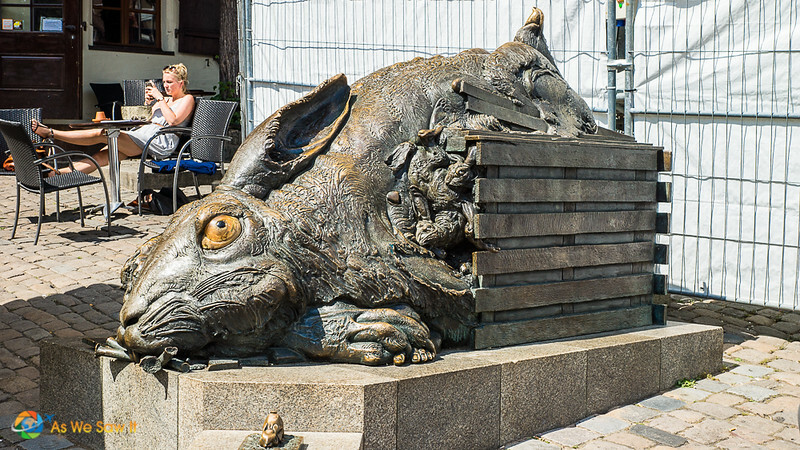 Our bus dropped us off at the edge of old town Nuremberg and we began our walking tour. No sooner had we stepped off the bus than we noticed that we were standing next to some very impressive stone walls and what looked like a moat. 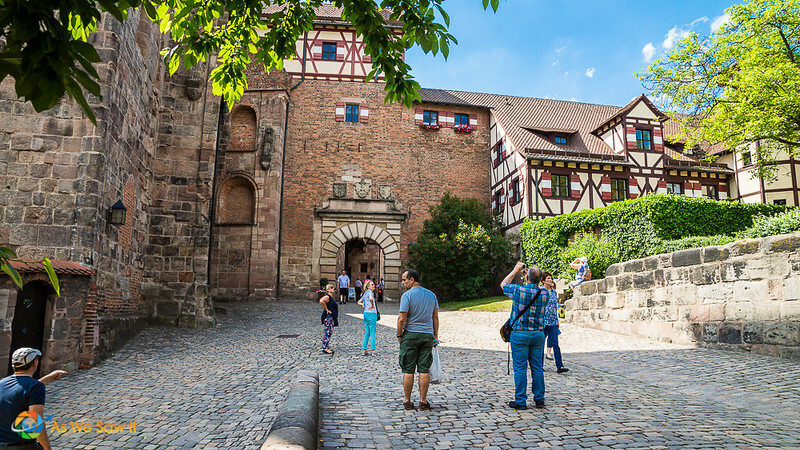 After we had synced our listening devices our guide began his tour right there, because we were standing next to – look above you – the Imperial Castle of Nuremberg. Entry to the castle is available for a fee; outside areas are free of charge. There is a guided tour of the Castle … but only in German. The castle is surrounded by two sets of walls: the taller, inside one was built first, to protect the castle. Later, they built the smaller, outer wall to keep people out of the moat. Actually, the moat was never intended to be filled with water. Instead it was created to keep game so that the King could hunt with his guests whenever he wanted to. This better explains why they wanted to keep people out of the moat, doesn’t it? 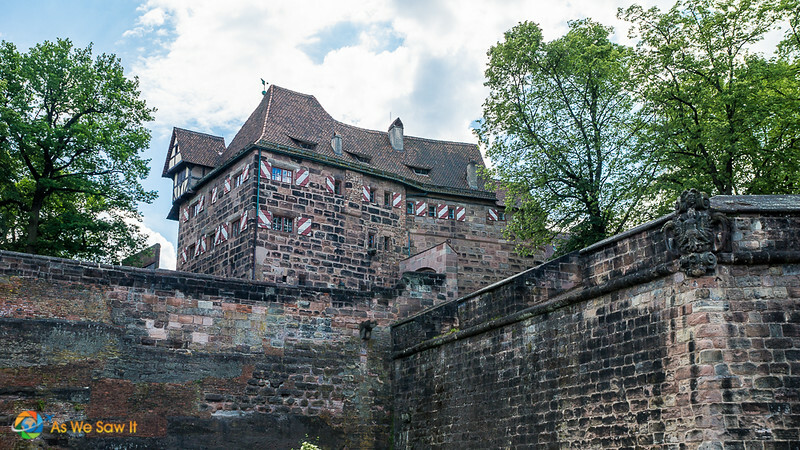 We followed as our guide told us more about Nuremberg Castle. The castle began around 1050 as a refuge and was eventually expanded to three distinct buildings. The view from the castle ramparts was extraordinary. We could even see Zeppelin Field from there. Our tour group wound along the streets toward Hauptmarkt, the city center's largest market square. We passed many interesting sights along the way. This guy is an irreverent nod to Nuremberg artist Albrecht Durer's most famous painting. 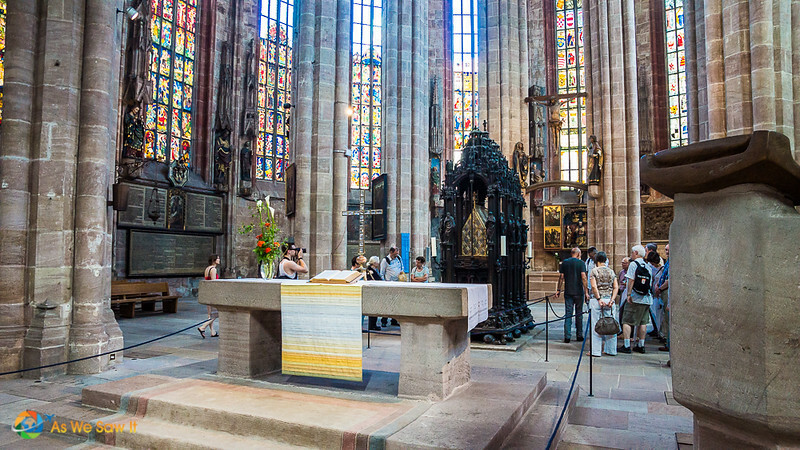 The oldest church in Nuremberg contains the relics of its namesake, St. Sebaldus, who is the patron saint of Nuremberg. The Lutheran church suffered serious damage during World War II and after it was rebuilt it became a Monument for Peace. Each column has a photo of Nuremburg's extensive devastation, sometimes accompanied by a poem. Peace – what is peace? to belong to the past? 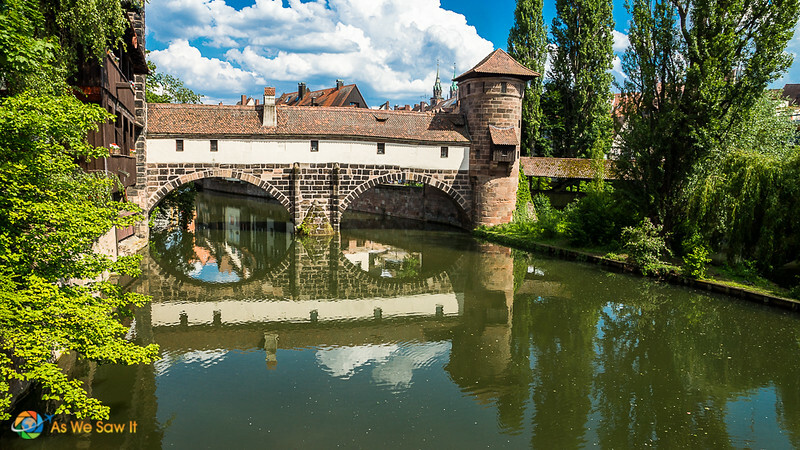 Nuremberg has a special covered bridge known as Henkersteg, the Hangman’s Bridge. Every city needed an executioner, and this man had to live in segregated accommodation within the city due to the nature of his trade. The reconstructed bridge is impressive and tours of the house are available. The hangman's house was built on the island at right. The view from the bridge was as extraordinary as the bridge itself. Oddly enough, Hospice of the Holy Spirit (Heilig-Geist-Spital) is only a few steps from Hangman's Bridge. It's been in use since 1332, which probably makes it one of the oldest hospitals in the world. 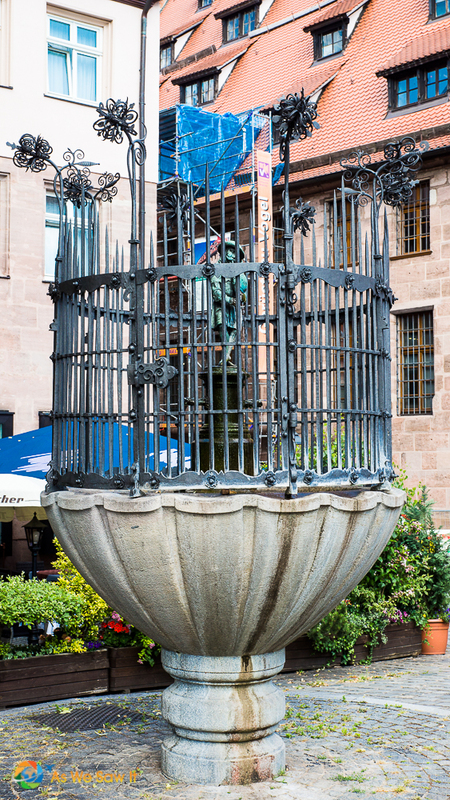 Back at Hauptmarkt our walking tour ended near Beautiful Fountain, dating from the late 1300s. It has a legend about a ring in the latticework that will bring you luck if turned 3 times. 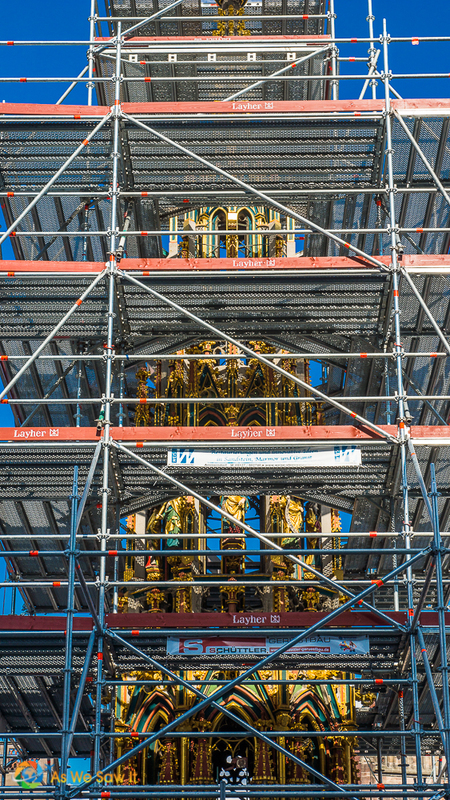 It’s undergoing restoration but will be beautiful indeed when it is completed. 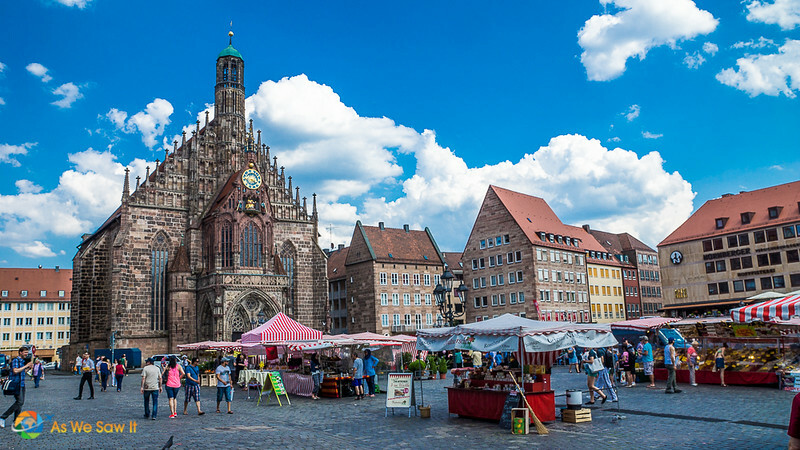 Hauptmarkt is Nuremberg's main market square. One thing about market squares: They usually contain markets. 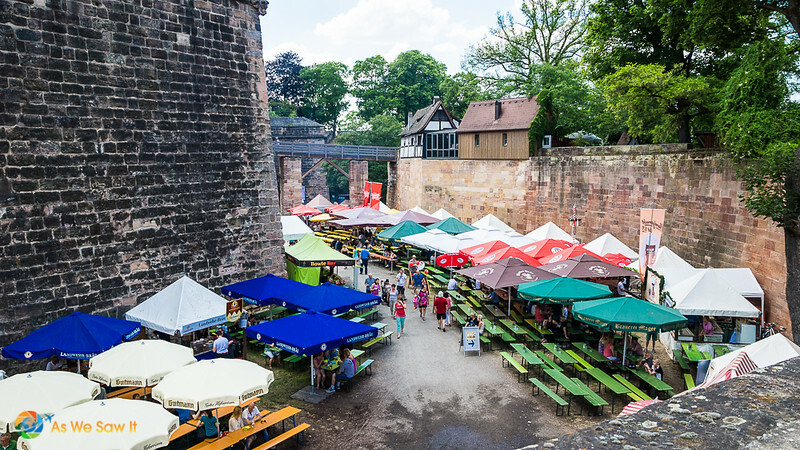 Sure enough, all the seasonal festival markets (such as the well-known Christmas Market) are held here. 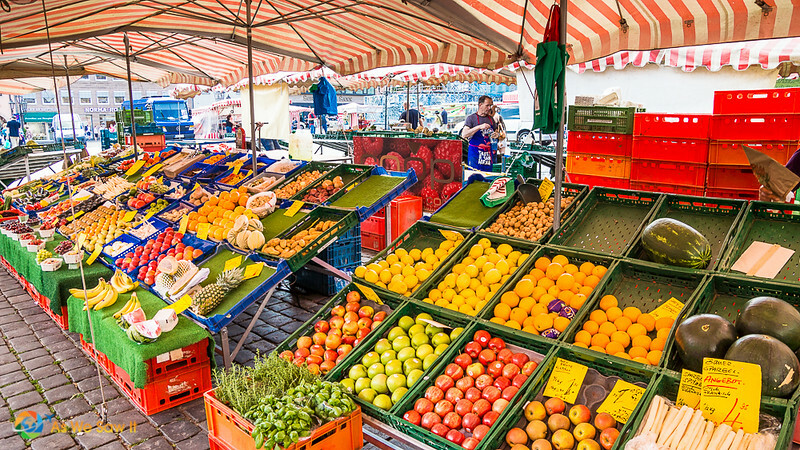 The rest of the time you’ll find a regular farmer’s market there with everything from produce to cheeses to treats and souvenir stalls. The Gothic Frauenkirche (Church of Our Lady) is also on Hauptmarkt Square, built on the site of a synagogue that King Charles IV had torn down during a pogrom in 1349. The mechanical clock shows that same Charles IV on his throne where each day at noon, electors come to pay him homage. We made a point of stopping at a stall selling Lebkuchen, Nuremberg’s famous traditional gingerbread. (It was so tasty that we didn't even think to take a photo!) Though the tasty cookie is made from wheat flour, some bakers are now preparing a gluten-free variety. We tried both and discovered that both have the same unique aroma and flavor. After that we decided to rest our tired feet at a brauhaus for the last few minutes of our free time. Thanks to our tour guide we knew how to hold our beer mugs correctly, so we didn't embarrass ourselves. Using two hands is a no-no. Hold your mug like this! After dinner we joined the others in the lounge for some onboard entertainment: “Melodies from the Danube to the Adriatic Sea.” Opera singers from Nuremberg and Munich performed selections from Mozart’s The Magic Flute and Verdi’s La Traviata and got the passengers to join them in the fun. 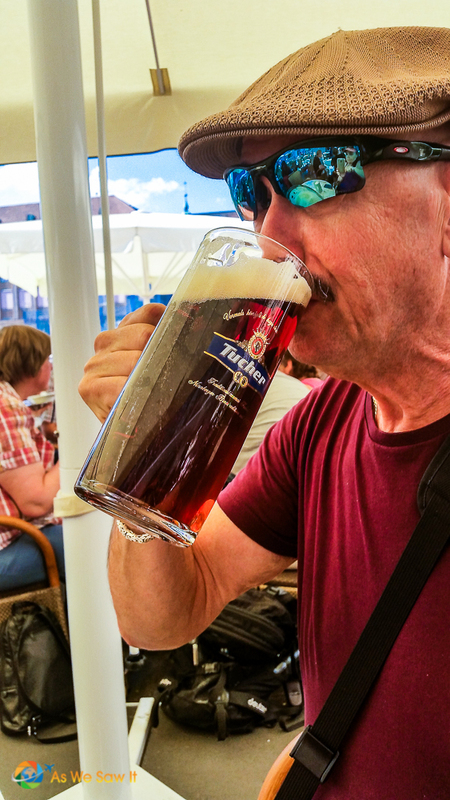 Click here to see more photos from our day in Nuremberg Germany. Thanks, Liz. Dan absolutely loves street photography. He takes so many great shots. It’s a shame I can’t share more of his galleries in my posts. Not enough space!